Visual: Black. Thin dark brown creamy head. Nose: Thick and cloying. Nutty and sour dough. Light perfumed and spice. Brown bread. Chocolate hints. Tabasco sauce and ketchup. Body: Condensed cream. Burnt macaroon bases. Milky chocolate. Mild brown sauce. Fruity chilli sauce. Cherries. Cinnamon apples. Finish: Coconut. Dried mango. Brown sauce and burger meat. Chocolate cake. Conclusion: I was kind of expecting this to concentrate on the chocolate cake, it is half the name and the part I would most commonly associate with stouts. Well the chocolate cake is there, delivered pretty big as well, but it is far from the whole story. The story is spicy touched but not harsh or one note. The story is a fruity chilli sauce through to a brown sauce touch, all over a thick textured beer that leaves your mouth feeling like you have chewed a burger as much as had a drink for the imagery it brings. The chocolate sweetness is thick and condensed cream like that allows all those condiment sauces and spice elements to work as a turbulent undertow that drags you into its depths then blasts you back into the thick sweetness – a wonderful contrast that works magic in your mouth. To get a hint of what is come with this beer, to get a beer overture, all you need to do is take your time and let the aroma in. It is all hinted at there. the juicy warm sauce just floats out over the glass bubbled over the chocolate. 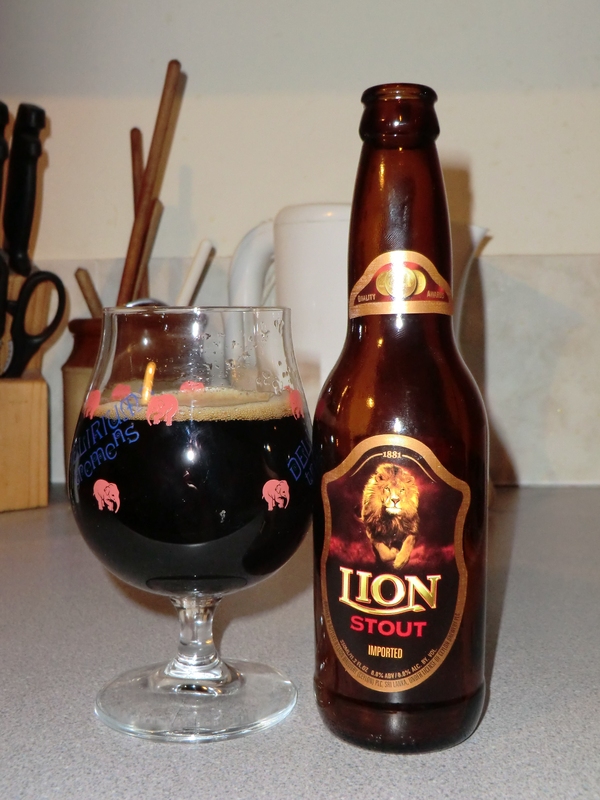 Frankly an excellent beer – so different, so fruit, warm, thick and so chocolaty – yet still so smooth. The alcohol is so eased out that this could be just a jalapeno chilli dipped chocolate milkshake for all you would know. Drunk at the end of 2015 and as I drink this it is one of the great beers of 2015, and that is saying something. Background: This was highly recommended to me at Independent Spirit, I put off grabbing it for a while as my cupboard was stout heavy at the time. As you can tell, I finally picked it up. This was the first use of the new stout glass given to me by craft beer sis at Christmas. many thanks. Only the wheat ale glass to go! This beer was made with coca nibs, cyprus wood and lactose. Drunk while listening to Akala and Napalm Death again. Visual: Black. Small head of coffee sud froth. Nose: Bubblegum. Crushed peanuts. Fresh cookie dough. Milky coffee. Cream cheese and chives. Roasted hazelnuts. Vanilla toffee. Body: Charred oak. Sour dough. Bitter and lightly earthy. Vanilla toffee. Light coffee. Bubblegum. Finish: Bitter and charred. Earth hops. Soil. Vanilla toffee. Treacle. Bitter chocolate. Conclusion: So, the legend that is Nigerian Guinness, finally here before me. I have heard so much about this over the years as I mention in the background – so, how is it? Eh, not bad. The aroma is awesome, mixing dough coffee, roasted character and vanilla toffee in this thick, odd, bubblegummy mix. It is very evident, unusual and speaks well of what is to come. The initial first impressions were running pretty high. Main body continues some of that, but there is a kind of empty charred character at the core which pushes a lot of the more interesting characteristics out to the edges. In the fact the weakest elements of this seem to be that it feels, at the base, closer to standard bottled Guinness than the other, foreign extra bottlings. I’m not sure how, they just feel heavier duty. Still, the edges use the more fun notes with more sweetness and more roasted character, giving extra layers to the beer. I can see how it got its rep, especially back in the day when the more roasted hoppy stouts were not that common. Back then this must have been an assault in the senses. Even now, at the top and tail it is a good beer with great use of the unusual elements. The bitter chocolate in the finish especially stands out against the more roasted hop character. It is just that mid body that doesn’t quite land the vault. Still ok, and I can say I’ve had it now. Guess I am glad I tried it just because of its reputation, but I can’t see myself coming back to it. 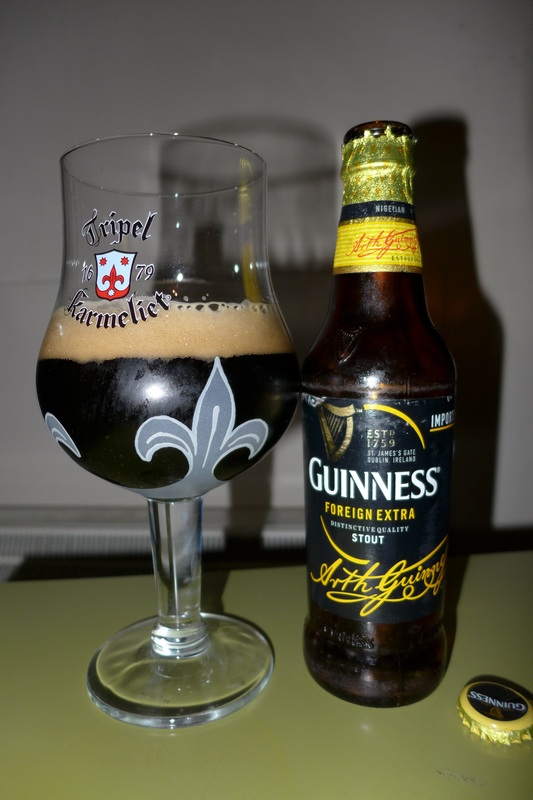 Background: Ah, the legend of the Nigerian Guinness. I’ve heard about this one for many years, but never managed to pick up a bottle. The tales have described it as anything from treacle thick, to hop roasted to half way between the two. So, when Independent Spirit got it in I grabbed a bottle for experimentation. The legend is in my hands. Drunk while listening to Against Me!’s awesome Transgender Dysphoria Blues album. Visual: Black. Dark coffee bubbled head that is small and not long lasting. Nose: Roasted. Nutty. Bitter chocolate. Body: Bitter chocolate. Vanilla. Light cream and milk. Coffee. Nutty – peanuts. Sour dough touch. Finish: Charred touch. Bitter chocolate and chocolate cake. Milk. Milky coffee. Conclusion: Cake stout. Good name, that’s a very good name for this. This has a very chocolate cake feel – albeit slightly dry chocolate cake. Not in a bad way, but just in comparison to the very moist cream filled chocolate cake you can get. Quality, not stale if you know what I mean. So, of all the extra ingredients the chocolate seems to be the one that comes through the most. The coffee is there , but more milky and subdued, a backing rather than full on coffee cake. These extra ingredients sit nicely balanced amongst a lot of the more traditional stout notes -a roasted character with sour dough touches. It is nice that while the beer pushes the cake story it doesn’t limit itself to that single tale. Early on in the front of the beer it does feel like it needs a bit more weight, however the real fun comes out towards the back of the body and into the finish. That finish really lingers – it is like the beer is at its very best when you are not actually drinking it. Well at least if you have already sipped it at least once before. Still, over time the front does build up and gets enough heft to deliver the flavour throughout and becomes a very solid stout. 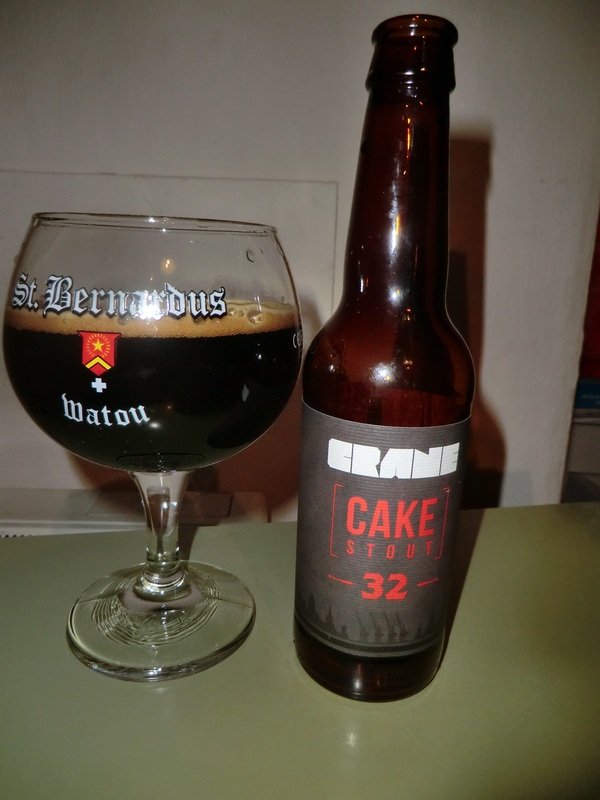 A very solid cake stout. Yep that definitely was the right name for the beer. Needs a touch more balance texture wise early on to make it solid all the way through, but overall delivers exactly what it says and delivers well. Background: I grabbed this from Corks Of Cotham. Mainly because I saw it was from a new brewery in Bristol. It is getting a crowded place for the beer scene now. Not sure if the 32 is part of the name or not, so I have left it there for now. Anyway, this is made with Ugandan vanilla beans, Peruvian cocoa nibs and Italian whole espresso beans. Visual: Opaque black. Medium coffee brown head that dissipates to dust in but moments. Nose: Roasted nuts, chalky and gritty. Praline. Hint of smoke and slight fish oil. Body: Rough texture initially. Praline. Mocha. Bitter. Diced nuts. The initially quite gritty feel in the mouth smoothes out somewhere around the half way point to a much more pleasing texture. Dates. Mussels. Finish: Slightly oily. Tobacco and smoke. Liquorice. Black coffee. Peanuts and bitter chocolate. Conclusion: I’m not quite sure where I stand on this beer, so I’m going to talk it out and see where it takes me. For the abv you would expect a beer with a more obvious character and bit of a showy style. Guinness foreign export stout has its very cloying style for example. This however plays things a little differently. I would never describe the flavour as understated, for one it would be a blatant lie, but the beers character could best be described as resolute. Like a brick wall it stands, with the flavour building slowly on the tongue brick by brick. The longer your hold it the more it builds, but never changing the base character. Apparently a beer designed to complement spicy foods well. Ok I can see that. The bitter and slightly oily body shifts for nothing. Hmm, in the end I think I’m on favour off it. Solid chocolate and coffee as expected, with a hint of seafood oils and smoke to make it a tad different. Definitely a beer of set purpose, and does that well. Not modest, not showy. It is what it is, tautological as that may be, and for that it has no regrets. 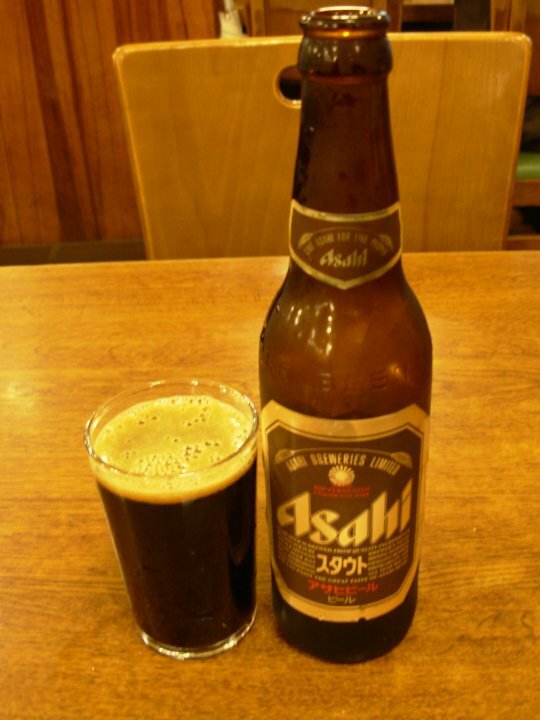 Background: Another of Michael Jackson’s 500 recommended beers. In fact a picture of him with corresponding quote adorns the back of the bottle. The abv seems to shift a lot, I’ve seen four different abvs listed for this beer over the past few years. Visual: Dark brown black with a smooth pour and middling beige head that is short lasting. Nose: Roasted nuts, liquorice and treacle. Slightly cloying cream. Sickly sweet like overripe fruit – but appealing, not off putting. Body: Roasted nuts, charred wood. Dark but sweet chocolate. Then rounds off with more nuts. Just slightly fizzy. Finish: Slick, thick treacle. Jelly, cloying cream again. Malt and milk chocolate. Black cherry. Finally a long experience of bitter chocolate. Conclusion: A drink comparable to Guinness export stout in its cloying nose, this beer however is far less thick and slightly more fizzy. As often is the case, the fizz is the weakness, but it is a mild flaw this time and does not overpower a wonderful roasted nut body which is pleasurable and leads to long lasting finish. The roasted nuts and dark colour make me wonder if this would be the perfect beer for drinking during the wonderful colours of the Obon celebrations. A good quality stout that resides just below the heavy hitters such as Sam Smiths and the Hercule stout, but still stands tall in a field of giants that is the stouts.